This pedestal mount, direct drive centrifugal pump achieves up to 103 gpm (309 lpm) and 90 psi (6.2 bar). The series includes models 9203P-S and 9500P-S.
Pentair Hypro centrifugal pumps handle big, high-capacity spraying jobs with ease. Use them for spraying liquid fertilizers and other chemicals, including wettable powder slurries for weed control. Make short work of other jobs - filling nurse tanks, watering seed beds, and transferring liquids. The broad, versatile line includes models with rugged housings of polypropylene that stand up to strong chemical herbicides. 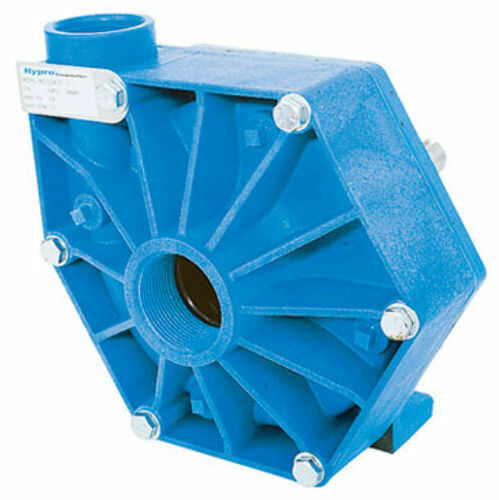 Polypropylene pumps are lightweight and provide excellent resistance to corrosive chemicals.